Some days I am very glad to own a dumb phone. Whenever people around me get panicky or irate about iPhone hacking, Android crashes or other smartphone voodoo I am very much the proud owner of an old Nokia so far behind the cutting edge that the average mugger would probably return it to me out of sympathy were I to be robbed in a dark alley. Another thing that makes me pleased to have a phone that can barely manage a 3D version of the quintessential late 90s to early Noughties timewaster 'Snake' is the quality and quantity of polished, exciting smartphone games. Put simply, if I had a decent phone I would spend much of my commute to my day job flinging angry birds at pigs or whatever, probably missing my stop and ending up in another city entirely on a painfully regular basis (and getting the sack with extreme prejudice). Luckily the much-lauded iPhone/iPad game Forget-Me-Not has been ported over to the PC and the Mac, which means that now I can be chronically distracted at home and only ruin my relationship and not my employment prospects. Hooray! If the original iOS version of the game is as good as the PC/Mac port then the laurels being thrown at it from all over the internet are well deserved. Forget-Me-Not is an obvious twist on the classic Pac-Man theme with added shooting, wall grinding and considerably more varied monsters. 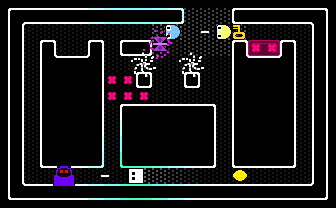 The hero of the game, a surprisingly characterful white square with black square eyes, must eat and shoot its way through the NEON DUNJUN (which should be the name of either the best or worst night club ever. I can’t decide). Throughout the glowing Pacmanic tunnels there are flowers to be collected and fruit to be eaten and sometimes mad stuff like this happens and rapidly reproducing things are every bloody where and then a ghost comes and you DIE. Then you do it all again. Three cheers for addiction! The maps are randomly generated for maximum replay value, and something I find very cool about this game is the fact that it doesn’t mess about taking ages to introduce you to all the cool stuff that wants to kill you. This bonkers scene is from the first level. 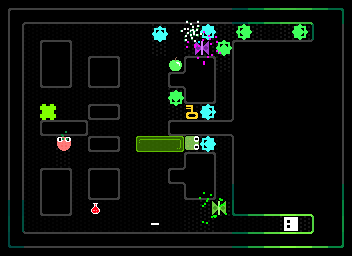 Those spiky things are actually killing each other, and that green jelly oblong was extruded from a bad guy that a spiky thing is kindly taking care of for me. The graphics are as relentlessly charming as the game is relentlessly fun. 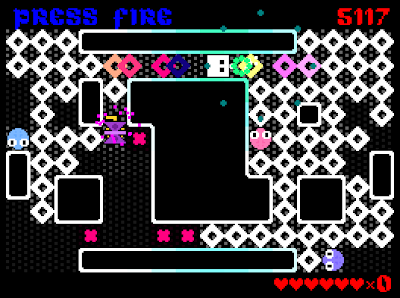 Vanquished enemies explode into delicious fields of cupcakes and burgers, crazy flashing things steal your keys from you, malicious yet cute looking ghosts waft ethereally around the map and walls explode. There is also a Chunky Mode graphics setting, which puts all the pixels on a course of steroids. The two player function is a lot of fun, and with the characters being in a constant state of firing it’s all too easy to kill each other, especially when stuff gets really frantic. Even in single player mode it’s quite easy to shoot yourself in the back, taking advantage of the Pac-Man style teleporting side tunnels. In fact, if the random number generator decides to create a map with two such tunnels facing each other a steady stream of bullets forever crossing the screen can quickly be created. In this case you can actually shoot down your own bullets like some kind of ridiculous gunslinger who just had his key stolen by a mushroom thing, and now it’s gone all dark again and the ghost is back and AAAAAAAAAaaaaaaaarrrgghhh...! This game is a total romp. There’s not a lot more I can write about it than that. It is a dirty amount of fun.